- Beginning April 23 – May 6, receive a 15% discount on all items. -If purchasing a Body-Bar for Mother’s Day, choose the special Mother’s Day quote. -All Mother’s Day gifts will be gift wrapped and will include a personalized gift card. - Travel Pack’s, Almost Everything and Everything Please will also include a silver scissor charm and a wonderful sample of soap made with organic ingredients. To receive the 15% discount at check out use code MDKMG13. The code is good April 23 – May 6th. Jasmin has been working on the Antler cardigan and is thinking about getting horn buttons to finish it. 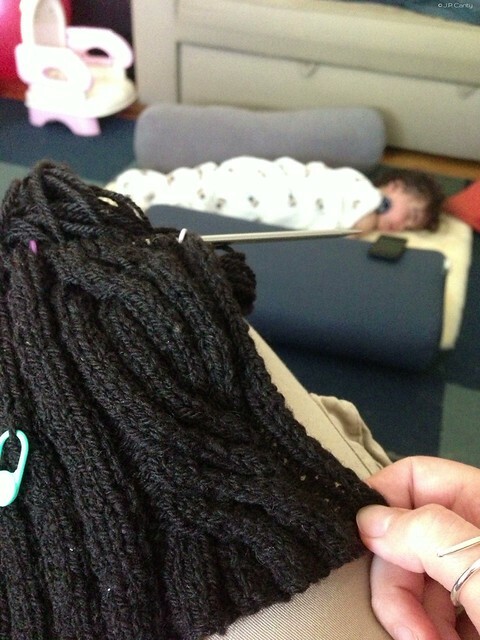 She is very happy about the Knit Evenly app. Gigi reminisces about German regional costumes. She is working on the Ginko Leaves shawl. She looked up Jeny's Surpisingly Stretchy Bind-Off on YouTube, and is thrilled with it. Jasmin is working on Stephen West's Boneyard shawl. Also, she fell down the rabbit hole and bought some Vincent van Gogh sock yarn by Opal. She is planning to knit Houdini socks with it. Gigi put a few rows on the rosa rubiginosa socks from The Knitters Curiosity Cabinet. Jasmin has been making tracks on her Eadon sweater. Todays bit of wisdom is: Go clean your room! Gigi was working on the pinus silvestry sock and got caught up in saving some stitches, which turned out to be more work. She had started the Wrapped in Leaves shawl in the wrong weight, and so frogged all of it. Watching TV had her so distracted that she messed up the toe on a vanilla sock. Gigi very helpfully decided to help Jasmin knit her new Van Gogh yarn and started the Firestarter socks, and couldn't manage the cables, so she ripped back to the toe. She is working on the Celaeno by Romi Hill and discovered that she had too many stitches in her lace. And after knitting some more on lace where she had messed up, she finally decided that she needs to pull back a few rows. This week we are purloining the Guernsey segment of the iMake podcast hosted by Martine, and Jasmin talks about a trip to Happy Hollow, and Kelly Park and the Japanese Friendship Garden. Jasmin and Ms Kalendar of the Brass Needles podcast sewed baby blankets. Jasmin's blanket is intended for the babies of Erin from the Anatomy of Knitting podcast. Gigi fixed the binding for the quilt she is repairing, and then sewed it on. Jasmin is zooming along on the body of the Eadon. Gigi has started the lace edge of the Ginko Crescent Shawl out of Abstract Fiber Yarn in the colorway Saffron. Jasmin has started the Boneyard Shawl. Gigi is working on the Cedar Leaf Shawl out of Abstract Fiber in the "Soar" colorway. We go on about the Twin Set Design podcast, hosted by Jan and Ellen. We reference Abby Franquemont . We mention The Knitting Pipeline podcast, and Elizabeth Zimmerman. We are answering a question from the "What do you want to hear about" thread about steeking. Jasmin recommends The Philosopher's Wool Guide to Fair Isle Sweaters Simplified . She mentions Black Water Abbey Yarns, and also recommends Lucy Neatby's videos. Gigi was attacked by her Celeano shawl, and mentions her Frost Flowers shawl. And she ran out of sock needles, trying to cast on all the socks from The Knitters Curiosity Cabinet. She didn't read the directions for the Pinus Silvestry socks that she is Knitting out of Cephalopod Yarn, and had to restart. Jasmin is working on the piping of a baby blanket she is sewing for Erin from The Anatomy of Knitting podcast. Gigi has cut the binding for the quilt she is working on too wide, and needs to pull it out and cut it narrower. Jasmin is thinking about making the Kaleidoscopic Kites quilt. Gigi has started on the lace part of the Celaeno, by Romi Hill, and is enjoying knitting with beads. Jasmin has started the Eadon from our SPAKAL project. Gigi is knitting a pair of Vanilla socks for Grandpa Knitmore out of Opal. Jasmin is working on the Antler cardigan for Genevieve. She is enjoying working with the cable needle ring from Leslie Wind. Gigi is making a pair of tube socks for Genevieve. Gigi has started the Ginko Crescent Shawl, out of Supersock from Abstract Fiber in the "saffron" colorway. This pattern was suggested by the nice people from Zen Garden. Jasmin and Genevieve also like this color a lot and Jasmin is planning to knit the Wee Wildflower cardigan for Genevieve. Jasmin is working on her Eadon, and had managed to mis-cross the left side of her cables. Gigi was planning to start the Wrapped in Leaves (Gigi called it Cedarleaf Shawl by mistake), out of Abstract Fiber's Supersock in the colorway Soar. Wrong gauge. Jasmin talks about the Big Girl Jacket for Boo, and Gigi's funny pictures. She also mentions Jadecat's blog article on depth of field and settings. This week we are reviewing Men's Knits by Erika Knight, and Boyfriend Sweaters , by Bruce Weinstein. Gigi is working on a re-binding a quilt. She sewed the strips she cut together, pressed and rolled them for storage.